Glaucoma continues to be a major public health problem. It is the second leading cause of blindness worldwide after cataracts. In the United States, primary open-angle glaucoma is the most common form of glaucoma and is the leading cause of irreversible blindness in African Americans. This disease is typically asymptomatic until advanced visual field loss occurs. Some of the risk factors for primary open-angle glaucoma have been extensively described and studied, including elevated intraocular pressure, advancing age, family history, African ancestry, myopia, and perhaps presence of certain systemic diseases, such as diabetes and hypertension. The precise mechanism of increased resistance to aqueous outflow remains unclear and is currently an active focus of research. At present, all our treatment strategies are directed at lowering intraocular pressure. Initial treatment is usually started with topical or oral medications. However, with progressive damage, laser trabeculoplasty may be considered as an adjunctive therapy, followed by incisional glaucoma surgery, either with trabeculectomy or glaucoma drainage implant. Glaucoma describes a group of conditions in which there is characteristic cupping of the optic disc with corresponding visual field defects, due to retinal ganglion cell loss. It is a progressive condition and is the most common cause of irreversible blindness worldwide. Primary open angle glaucoma (POAG) is a subset of the glaucomas defined by an open, normal appearing anterior chamber angle and raised intraocular pressure (IOP), with no other underlying disease. If there is an identifiable underlying cause for raised IOP, this is termed secondary glaucoma. If the IOP is within normal limits, this is termed normal tension glaucoma (NTG). Secondary glaucoma and NTG are not discussed in this section. The final common pathway for all potential etiologies of POAG is optic nerve head damage. This is thought to be secondary to primarily ganglion cell axon loss, although loss of blood vessels and glial cells has also been observed. There are many postulated mechanisms of ganglion cell damage. There is good evidence that IOP related mechanisms of optic nerve damage are very important in the pathogenesis of POAG. By definition, patients with POAG have raised IOP. 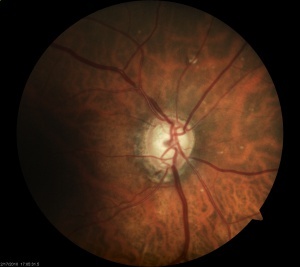 Raised IOP is an important risk factor for the progression to POAG from ocular hypertension (OHT), and is the only common clinical finding in a wide variety of secondary glaucomas. IOP seems to be important even in NTG, as reduction of IOP was shown to reduce the risk of progression in these patients in the Collaborative Normal Tension Glaucoma Study. In animal models, raised IOP always precedes glaucomatous nerve damage. It is thought that raised IOP primarily affects the optic nerve via the mechanical changes at the lamina cribrosa. There is consensus that the etiology of raised IOP is due to reduced aqueous outflow, rather than over-production of aqueous. Several theories exist as to the cause of reduced aqueous outflow (see below). A proportion of patients develop glaucoma and continue to progress despite low IOP. Equally, a proportion of patients with elevated IOP never develop POAG. This supports the theories of IOP independent mechanisms of glaucomatous nerve damage. These include ischemia, loss of neurotrophic factors, neurotoxicity, and failure of cellular repair mechanisms. IOP is considered the most important risk factor for the development of POAG, and remains the only known modifiable risk factor. Raised IOP in animal models results in glaucomatous optic neuropathy. Population studies have shown increased prevalence of glaucoma with increasing IOP. In patients with OHT (raised IOP but no signs of glaucomatous optic disc or visual field changes), higher IOP is associated with a higher risk of developing POAG. This has been shown in the OHTS (Ocular Hypertension Treatment Study) and the EGPS (European Glaucoma Prevention Study). IOP is also thought to be a risk factor for NTG, despite IOP never being higher than the normal range. The prevalence of POAG increases with age, even after compensating for the association between age and IOP. Age was also found to be an important risk factor for the conversion of OHT to POAG in both OHTS and EGPS. Several studies have shown POAG to be more prevalent in people of African-Caribbean descent compared with Caucasians. Not only is POAG more prevalent in black race, its onset is earlier, and disease progression has been shown to be faster and more refractory to treatment. Black patients with OHT have been found to be more likely to progress to POAG. The prevalence of POAG in Hispanics is thought to be between that of African-Caribbean and Caucasian populations. Myopia has been shown to be a risk factor for POAG in several studies. However, it can be difficult to diagnose true POAG in myopic patients and controversy exists over whether it is real risk factor. Myopic optic discs are notoriously difficult to assess, and myopic patients may have visual field defects unrelated to any glaucomatous process. A thinner cornea has been shown to be a risk factor for OHT patients developing POAG. This may be in part due to IOP measurement error (IOP tends to be read lower in patients with thinner corneas), but there are also theories that a thinner cornea may indicate less rigid support structures around the optic nerve head, and a resultant increased propensity to damage. A first-degree relative with POAG is a risk factor for the development of POAG. This has been reported in several studies with the odds ratio varying from 3 to 13. The risk is thought to be higher still if the affected relative is a sibling. Several genes associated with POAG have been identified, though these account for less than 5% of all POAG in the general population. It is therefore thought that the hereditary aspect of POAG is likely to be polygenic and that gene-environment interactions are important. A high prevalence of POAG has been found in diabetic patients, and a high prevalence of diabetes has been found in POAG patients. However, controversy exists as to whether diabetes truly is a risk factor for POAG, as several large population studies have found no association. The role of blood pressure in the development of POAG is complicated and there is no consensus. Hypertension may predispose to glaucomatous damage via increased peripheral vascular resistance in small vessels, while a low blood pressure may reduce the perfusion pressure of the optic disc. There is a relative paucity of data regarding the lifestyle and nutritional epidemiology of POAG. There is a suggestion that exercise and a diet high in green collards and with a high omega 6 to omega 3 fatty acid ratio are protective against POAG. Many different abnormalities have been noted on histopathological examination of the drainage angle in patients with POAG. These include narrowed intertrabecular spaces, thickened basement membranes, fused trabecular beams, reduction in trabecular endothelial cells, reduction in actin filaments, narrowing of collector channels, foreign material accumulation, scleral spur thickening, and closure of Schlemm’s canal. A commonly held view is that glaucoma is a group of conditions with varying pathophysiological processes that share a common end-point of optic nerve head damage. There are multiple proposed mechanisms of damage, some of which are IOP- dependent, and others are IOP- independent. It has been suggested that these changes may be brought on by altered endogenous corticosteroid metabolism (with secondary trabecular meshwork changes) or oxidative damage. Visual loss from glaucoma is irreversible, and therefore prevention is a key strategy to preventing morbidity from this condition. It is recommended that people over 40 years of age should receive a baseline examination. The patient's underlying characteristics and risk factors determine the frequency of follow-up visits. Primary prevention of POAG has been shown to occur in the setting of OHT patients. These patients have elevated IOP but no structural or functional evidence of optic nerve damage. Data from OHTS and EGPS have shown that the risk of developing POAG in OHT patients can be reduced by using topical therapy to lower IOP. Please see the table below on evidence-based guidelines in terms of risk factors. Not enough is currently known about the lifestyle or nutritional epidemiology of glaucoma to inform the public of any health strategies for the prevention of glaucoma. Additional research is required in this area. Frequently, the diagnosis is not clear-cut and the patient may present with some risk factors and signs, but not others. In such cases, the patient may be labeled as a glaucoma suspect. These patients require repeat assessments at regular intervals with the frequency of visits dependent upon index of suspicion. The majority of patients with POAG are asymptomatic. Typically, patients are only symptomatic in late disease, when they may become aware of constricted visual field or blurred vision. Occasionally, patients become aware of earlier visual field defects when performing monocular tasks (such as using the viewfinder of a camera). More frequently, patients are usually diagnosed as part of a routine eye test or as an incidental finding when presenting with another ophthalmic condition (e.g. diabetic retinopathy). A detailed general history would reveal any causes of secondary glaucomas (and therefore refuting POAG), such as steroid usage. Physical examination consists of assessment of IOP, anterior chamber angle, optic disc and visual field. The gold standard for IOP measurement is Goldmann Applanation Tonometry (GAT). This is not available in all instances, and non-contact tonometry is also frequently used. In the UK, this is certainly true in the community where optometrists’ preferred method of IOP measurement is non-contact. Almost standard now, in conjunction with tonometry, is the measurement of central corneal thickness (CCT). Theoretically, a thinner cornea may lead to measurements that under-estimate true IOP and vice versa. However, the effect of CCT on IOP measurement is not predictable, and there is no consensus as to the degree of under- or over-estimation of IOP that occurs with thinner or thicker corneas. Moreover, CCT is only one biomechanical attribute of a cornea. For example, a thin cornea that is very stiff may still result in over-estimation of IOP. Newer methods of IOP measurement aim to overcome variations in corneal biomechanics and give a more accurate estimate of true IOP. These include the Reichert Ocular Response Analyzer (ORA) and the Pascal Dynamic Contour Tonometer (DCT). The ORA is a non-contact tonometer that measures a biomechanical attribute of the cornea termed hysteresis. The DCT uses uses principle of contour matching instead of applanation to reduce the effect of corneal biomechanics. For more information on tonometry, please see the section Intraocular Pressure and Tonometry. The anterior chamber angle is assessed clinically using the slit lamp (Van Herick technique) and with gonioscopy. Newer techniques for angle assessment include UBM (Ultrasound Biomicroscopy) and AS-OCT (Anterior Segment Optical Coherence Tomography). Clinical examination of the optic disc is a very important part of the assessment of patients with POAG. Direct ophthalmoscopy offers the most magnified view of the optic disc, but the view is not stereoscopic. Slit lamp biomicroscopy with a lens that offers large magnification (e.g. 60 dioptre or super 66) has the advantage of giving a stereoscopic view. Stereoscopic disc photographs offer a useful documentation of optic disc status, and also allow masked assessment in trials. Clinical assessment of an optic disc is still considered the gold standard in the diagnosis of POAG, though the inter-observer agreement is notoriously variable. Therefore, there is a drive for more objective optic disc assessment such as Heidelberg Retinal Tomography (HRT) and Ocular Coherence Tomography (OCT). Assessment of the nerve fiber layer surrounding the disc by the GDx is also useful. Automated static threshold perimetry (e.g. Humphrey field analysis) is the gold standard for diagnosis and monitoring of POAG. Various testing algorithms have been validated for POAG and allow reduced testing time for patients (e.g. Swedish Interactive Threshold Algorithm, SITA). Patients with early POAG may have normal visual fields on testing, and it has been estimated that 50% of ganglion cells need to be lost before a field defect becomes apparent. This rationale has led to development of new perimetric tests such as short-wavelength automated perimetry (SWAP) and frequency doubling technology (FDT), which may be able to enhance earlier detection of functional loss by targeting a specific subset of ganglion cells that have sparse distribution. The International Society for Geographical and Epidemiological Ophthalmology has published a consensus definition for POAG. This definition does not include IOP - i.e. POAG is diagnosed based on signs of glaucomatous optic neuropathy regardless of the level of IOP. Patients can be classified as normal tension glaucoma (NTG) or high tension glaucoma (HTG) based on the IOP. Sometimes an IOP spike may be missed in a clinical setting. In these cases, if HTG is suspected, measurement of IOP at hourly intervals throughout the day, beginning in the early morning, may be indicated. This is termed phasing. If a patient has all the features of POAG but consistently normal IOPs (less than or equal to 21 mmHg), this is considered NTG (discussed further in another section). By definition, the anterior chamber angle of POAG patients is open. The Van Herick test provides an estimate of anterior chamber depth peripherally and reveals an irido-corneal distance of greater than 25% of corneal thickness. Gonioscopy is essential to make the diagnosis of POAG and should be performed on the initial visit. Various classifications systems have been described to assess the extent of an open angle. Gonioscopy helps to differentiate POAG from secondary open angle glaucomas (such as pigment dispersion in pigmentary glaucoma or neovascularization of the angle in neovascular glaucoma). See the section History above. Advanced POAG is a relatively clinical diagnosis. Patients will have undisputable characteristic optic nerve damage and restricted visual fields. However, visual function loss from POAG is irreversible; therefore, it is critical to diagnose this disease as early as possible and prevent further loss of vision. Diagnosis of early POAG is more difficult. Optic disc changes or visual field abnormalities may be more equivocal. When the evidence for POAG is not compelling enough to commence therapy, the patient is referred to as a glaucoma suspect and reviewed regularly to watch for any signs of progression. An experienced clinician is able to assess clinical examination findings in conjunction with investigation results and make a decision as to the diagnosis. Clinical findings corresponding with investigative findings add weight to the diagnosis of POAG. 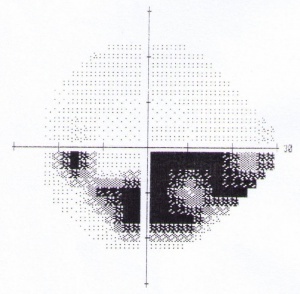 For example, Figure 1 shows the left optic disc of a patient, and Figure 3 shows the left visual field of the same patient. The thinning of the superior neuro-retinal rim of the optic disc corresponds well with the dense inferior arcuate scotoma in the visual field. This provides strong evidence for glaucoma. Another important characteristic of POAG is that it is a progressive disease. If optic disc appearances and visual field changes are static on no therapy, this would count against a diagnosis of glaucoma. Diagnostic procedures such as HRT, OCT and GDx are useful objective adjuncts to clinical optic disc assessment. Quantitative measures such as neuro-retinal rim area or volume and retinal nerve fiber layer thickness are useful for monitoring and assessing progression. Also, when compared with normal population values, they may give some indication of diagnosis (e.g. Moorfields Regression Analysis for HRT). This is discussed in more detail in the section Optic Nerve and Retinal Nerve Fiber Imaging. Visual field testing is also useful for assessing progression. The video below shows progression of an inferior arcuate scotoma in a patient with glaucoma over a 4 year period. For more information, please see section Standard Automated Perimetry. At present, no laboratory tests are routinely used in the diagnosis or management of POAG. Vision loss from POAG is irreversible. Management is, therefore, aimed at slowing the progression of the disease, thereby maintaining optimum visual function. The only proven treatment for POAG is lowering IOP. There is now substantial evidence from randomized trials that lowering IOP reduces the risk of progression of POAG (Advanced Glaucoma Intervention Study – AGIS, Early Manifest Glaucoma Trial – EMGT) and reduces the risk of conversion from OHT to POAG (OHTS, EGPS). However, to date, there is no controlled trials for POAG, with randomization to treatment or observation. A multicenter clinical trial based in the UK is under-way which will hopefully address this. The study is comparing the rate of progression in early POAG between patients receiving latanoprost or placebo. IOP may be lowered by medical therapy (topical and systemic), laser therapy and surgical procedures. There is no strong evidence supporting which of medical, laser or surgical therapy should be given initially. For example, the CIGTS (Collaborative Initial Glaucoma Treatment Study) showed no significant difference in outcome between patients randomized to either medical therapy or trabeculectomy. Commonly, patients are started on medical therapy with possible adjunctive laser therapy, and only if these measures fail is surgery considered. Unfortunately, some POAG patients continue to progress despite lowering of IOP. This provides some evidence that there are IOP-independent mechanisms at play. Therefore, searching for other reversible risk factors for POAG is essential. For example, this may come from epidemiological study of POAG and identifying lifestyle or nutritional risk factors associated with POAG. Reduced risk of progression was noted with IOP consistently below 18 mm Hg or largely below 14 mm Hg. Medical therapy may be topical or systemic. However, it is important to appreciate that topical medication may cause significant systemic side effects, especially beta-blockers. The most efficacious class of drops is the prostaglandin analogues. They are also the most convenient drops with once nightly dosage. Side effects are mainly local and include hyperemia, lengthening of lashes, darkening of iris color and peri-ocular skin pigmentation. These are reversible on stopping the medication. The second most efficacious class of drops is the beta-blockers. Topical alpha-agonists, carbonic anhydrase inhibitors and miotics are much less efficacious, rarely achieving a drop in IOP of greater than 3 mmHg. The best locally tolerated drops are the beta-blockers, with very few patients experiencing ocular discomfort or redness. However, beta-blockers also cause the most systemic side-effects. There is a significant amount of systemic absorption following passage through the nasolacrimal duct. Side effects include breathlessness, reduced exercise tolerance and falls. This is especially true for elderly patients, which is a significant proportion of the POAG population. Therefore, non-selective beta blockers are contraindicated in patients with respiratory diseases and some cardiac conditions. Typical first line therapies are prostaglandin analogues and beta-blockers. Prostaglandin analogues are more efficacious and have less systemic side effects. Beta-blockers may be preferred in younger patients due to less local side effects, or in unilateral glaucoma to avoid cosmetically undesirable asymmetrical side-effects (such as lash growth). Includes acetazolamide (carbonic anhydrase inhibitor given orally or intravenously) and the hyperosmotic agents (glycerin, mannitol). Oral beta-blockers lower IOP, though are not used for this indication. However, it is important to appreciate that a patient taking an oral beta-blocker, for hypertension for example, may have masked ocular hypertension. Furthermore, there may be little additional benefit in prescribing a topical beta-blocker for someone already taking an oral beta-blocker, though this may cause significantly worse side-effects. Please see section Medical Management for Primary Open Angle Glaucoma for more detailed information. Once the diagnosis of POAG has been established, it is important to carefully counsel the patient. They need to be informed of the natural history of the condition, initial asymptomatic presentation of the disease with irreversible visual loss in cases which are not treated or under treated. When starting a topical medication, the patient needs to understand the probability of life-long therapy, potential side-effects, the need to use the drops every day, and the fact that they will not notice any benefit – the treatment is preventative. It is important to teach patients how to administer drops effectively. It is popular practice to define a target IOP for IOP lowering. This would be based on current evidence, the stage of the patient’s POAG and other risk factors for progression. A reasonable initial target is for at least 20%-30% reduction in IOP. A larger reduction may well be needed for patients presenting with advanced disease. AGIS showed reduced risk of progression for patients who’s IOPs were consistently below 18 or largely below 15. IOP – is it within target? If the patient has no side effects, the IOP is within target level and there are no signs of progression, then a routine 3-4 month review can be arranged. If the initial therapy was not at all effective, it should be swapped for an alternative class of drop. If the initial therapy significantly reduced IOP, but not to target level, then an additional drop should be prescribed (or a combination drop used). If there are signs of progression despite target IOP, the target should be lowered further, and the patient more closely followed. If target IOP is not reached despite fully tolerated topical medications, laser or surgical therapy should be considered. All these therapies aim to lower IOP. Laser trabeculoplasty is a reasonable initial therapy, especially for patients in whom compliance may be an issue. It is particular effective in patients with pigmented drainage angles, though its long term success rate is limited. With the advent of anti-scarring agents (5-fluorouracil, mitomycin C) for augmentation, trabeculectomy remains a successful surgical treatment for POAG. Some studies comparing trabeculectomy to drainage device implantation suggest improved outcomes for drainage devices, though the evidence is still somewhat equivocal and shunt surgery is generally reserved for patients with high risk of failure from trabeculectomy (e.g. previous trabeculectomy, uveitis, aphakia). Non-penetrating drainage surgery is thought to be safer that standard trabeculectomy, but less efficacious in IOP lowering. Cyclodestructive procedures are generally reserved for eyes in which all other measures have failed, or in eyes with poor visual potential. This is due to the risk of long-term hypotony. Early surgical follow up is discussed in the individual sections on the surgical procedures. Longer term surgical follow up is similar to the assessment described above under Medical follow up. Essentially, 3-4 month review is sufficient for patients with target IOP and no signs of progression. If target IOP is not reached, or there are signs of progression, further therapy is required. Untreated POAG can lead to irreversible blindness. There is not much data on the natural history of POAG, as it is considered unethical to not treat patients with advanced disease. One study in St Lucia found that 35% of untreated eyes progressed to end-stage disease over 10 years. There is strong evidence that lowering IOP can reduce the rate of progression significantly. During 6 years of the EMGT, 53% progressed, though treatment reduced the rate of progression by half, and for each mmHg of IOP lowering achieved, the rate was reduced by 10%. Progression is noted to be worse in patients with more advanced disease at baseline. This may be because an already damaged disc is more susceptible to further damage, or simply that as there are fewer ganglion cell axons, each further one lost has a greater impact on function. Boyd K, McKinney JK. Glaucoma. American Academy of Ophthalmology. EyeSmart® Eye health. https://www.aao.org/eye-health/diseases/glaucoma-list. Accessed March 13, 2019. American Academy of Ophthalmology. Glaucoma: Primary open-angle glaucoma Practicing Ophthalmologists Learning System, 2017 - 2019 San Francisco: American Academy of Ophthalmology, 2017. Denniston A, Murray P. Oxford Handbook of Ophthalmology. Oxford, United Kingdom: Oxford University Press; 2006:276-277. Rhee D. Glaucoma: Color Atlas and Synopsis of Clinical Ophthalmology. New York, NY: McGraw-Hill; 2002:204-229. Schacknow P, Samples J. The Glaucoma Book: A Practical, Evidence-Based Approach to Patient Care. New York, NY: Springer; 2010:399-420. Stamper R, Lieberman M, Drake M. Becker-Shaffer’s Diagnosis and Therapy of the Glaucomas. 8th Edition. New York, NY: Mosby; 2009:239-265. This page was last modified on March 13, 2019, at 14:45. This page has been accessed 180,116 times.